Evelin is currently being detained at the Laredo Contract Detention Facility in Texas. After surviving 3 violent assaults and multiple threats to her life, Evelin decided to flee from El Salvador to reunite with her partner and family in the U.S. She has been in detention since she tried to enter the U.S. in March of 2015. In June of 2015, a U.S. Senior Asylum officer established that there is reasonable fear for Evelin to return to El Salvador and that it would be unsafe for her to be deported making her eligible to apply for and likely obtain asylum. Yet, ICE is still threatening to deport Evelin this Tuesday! While in detention Evelin participated in the Hutto hunger strikes led by detainees who protested the inhumane conditions and exposed the same system that does not insure asylum seekers like Evelin will not be harassed by ICE and threatened with deportation. There are federal laws and policies that protect women who are victims of crimes and would face violence if deported. Evelin deserves a chance to fight her case and rejoin her family away from the persecution she experienced in El Salvador and away from the traumatic experiences encountered inside immigrant detention centers. ICE should exercise prosecutorial discretion to release Evelin and let her rejoin her loved ones! Suggested script: Suggested script: “Hello, I’m calling in regards to Evelin Ramirez, A 202 072 468, I ask that ICE Director Saldana release Evelin and issue a favorable decision on her request for prosecutorial discretion. A U.S. Asylum Senior officer has already determined that it would be extremely dangerous for Evelin to be deported to El Salvador. She deserves a chance to rejoin her loved ones in the U.S. and obtain proper legal counsel for her case. 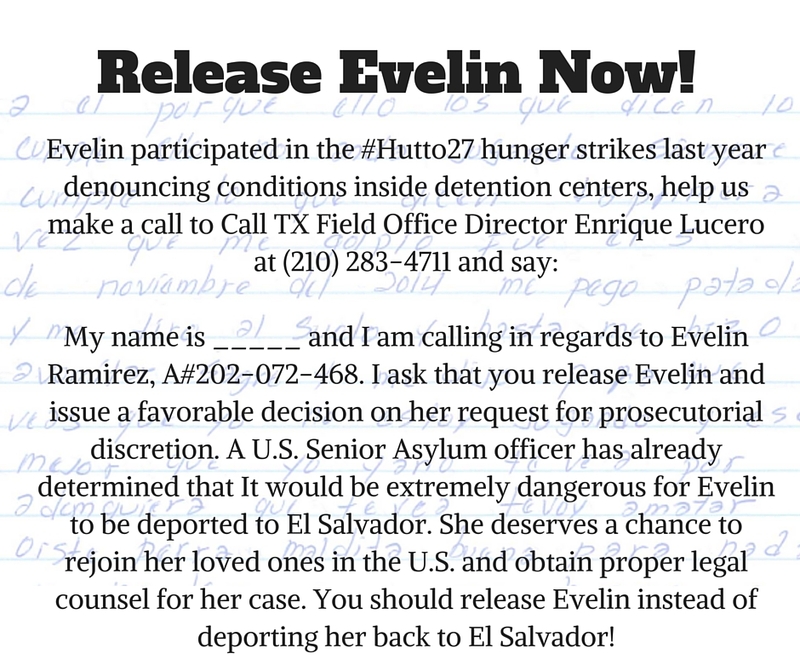 Release Evelin instead of deporting her back to El Salvador. Suggested script: “Hello, I’m calling in regards to Evelin Ramirez, A 202 072 468, I ask that Director Enrique Lucero release Evelin and issue a favorable decision on her request for prosecutorial discretion. A U.S. Asylum Senior officer has already determined that it would be extremely dangerous for Evelin to be deported to El Salvador. She deserves a chance to rejoin her loved ones in the U.S. and obtain proper legal counsel for her case. Release Evelin instead of deporting her back to El Salvador. I am writing with great concern regarding the case of Ms. Evelin Ramirez (A 202 072 468), who is currently detained at the South Texas Detention Center and is set to be deported on Tuesday, January 12, 2016. Ms. Ramirez came to the U.S. in March of 2015, fleeing from domestic violence and threats against her life. On June 5th, 2015 an asylum officer determined there is reasonable fear for Ms. Ramirez to return to El Salvador, making her eligible to apply for asylum but keeping her in detention. Last week ICE scheduled Ms. Ramirez’s deportation, thus denying her the opportunity to move forward with her asylum process and jeopardizing her life. Back in El Salvador Ms.Ramirez was the target of 3 violent assaults and threats between November 2014 and March 2015, which prompted her to leave her home. If deported to El Salvador Ms. Ramirez fears her life will be in danger again. Ms. Ramirez deserves the chance to fight her case, I urge you to use favorable use of prosecutorial discretion to stop her deportation and release her from the South Texas Detention Center. Her family and husband live in the U.S., please allow them to reunite instead of sending her to a place where faces imminent violence.